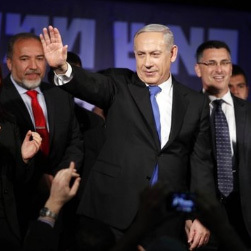 Coalition talks have begun in Israel after near-complete general election results gave right-wing and centre-left blocs 60 seats each in parliament. President Shimon Peres is expected to ask Prime Minister Benjamin Netanyahu to attempt to form a new government. His Likud-Beitenu alliance lost a quarter of its seats in the Knesset but remains the largest grouping with 31. He has offered to work with the newly-formed Yesh Atid party, which shocked observers by coming second with 19. However, its leader, popular former TV presenter Yair Lapid, has demanded reform of a law under which ultra-Orthodox Jewish seminary students can defer their military service. Religious parties in the current governing coalition are strongly opposed to any changes. Mr Lapid has also said he would only join a government that was committed to reviving the peace process with the Palestinians, which has stalled since Mr Netanyahu took office. “Whoever wants Yesh Atid in the coalition will need to bring these things,” Ofer Shelah, a senior member of the party, told Israeli Army Radio.